After a seven-month, 300m-mile journey, Nasa’s Mars InSight probe has reached its destination and touched down near the red planet’s equator. The lander came to a rest on the dusty surface shortly before 8pm GMT on Monday after a nail-biting descent that started when the spacecraft slammed into the Martian atmosphere at 12,300mph and ended minutes later with the probe settled on the ground, its thrusters quiet. InSight’s landing spot, Elysium Planitia, is one of the most boring places on the alien world: a vast, smooth lava plain that the US space agency calls “the biggest parking lot on Mars”. But a featureless, and hopefully quiet, landscape is precisely what InSight needs for its mission to map the interior of the planet. “This is our first opportunity to look deep inside another planet, to look at the structure and find out why it ended up the way it did,” said Rain Irshad, the autonomous systems group leader at RAL Space in Oxfordshire, and one of several UK scientists who worked on InSight’s instruments. InSight sent its first picture back within minutes of its new home. It was smudged and obscured by dust kicked up during the landing, but much clearer pictures are expected to be sent back soon. The $814m (£635m) lander will use a suite of instruments to study the makeup and dimensions of the planet’s core, mantle and crust. Armed with that data, scientists hope to learn how Mars – and other rocky worlds – formed at the dawn of the solar system 4.6bn years ago. Sending a probe to Mars, whether to land, orbit or fly past, is a risky business: only 40% of missions have succeeded. Nasa is the only space agency to have pulled off a Mars landing, most recently in 2012 when the Curiosity rover was winched to the surface by a hovering “sky crane”. In 2016, the European Space Agency attempted to put its own lander on Mars, but the Schiaparelli probe shut down its retro-rockets too soon and smashed into the ground. The InSight lander had to perform flawlessly to touch down safely. Soon after it hit the thin Martian atmosphere, it released a parachute, then blasted off its heat shield and fired retro-thrusters to slow its descent. 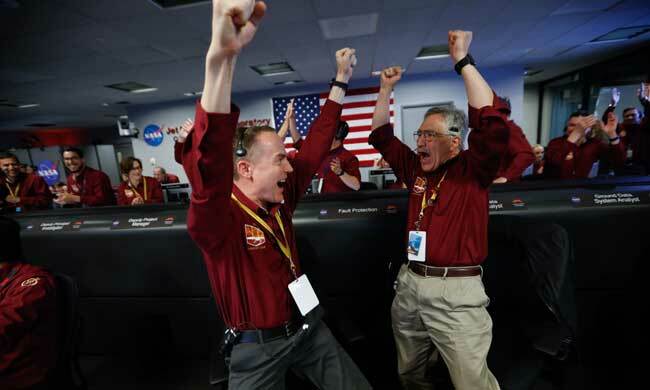 Confirmation that InSight had survived what Nasa called “the seven minutes of terror” was beamed back to Earth via satellites that trailed the probe to its destination. InSight, which is short for Interior Exploration Using Seismic Investigations, Geodesy and Heat Transport, will use three instruments to study Mars. A seismometer deployed by a robot arm will act as an ear to the ground and listen for tremors produced when subterranean rock faces slip past one another on geological fault lines. These pressure waves bounce around inside the planet, and can reveal crucial information about its structure. Mission scientists expect InSight to record anything from a dozen to 100 Marsquakes of magnitude 3.5 or greater over the lander’s two-year mission. The seismometer is so sensitive it can detect vibrations smaller than the width of an atom. “The most important question is whether Mars is seismically active,” said Neil Bowles, a planetary scientist at Oxford University, who worked on the spacecraft. “We have indirect evidence for shaking on the surface, for example by looking at boulders rolling down slopes in images from orbit, but InSight will be the first mission to place a seismometer directly on the surface of Mars. Another instrument, a heat probe, will burrow 5 metres into the ground and measure the rate at which heat rises through the planet. In a third experiment, mission scientists will use antennas on the lander to track its position with such precision they can deduce how much Mars wobbles on its axis. The amount of wobble reflects the size of the planet’s core and whether it is molten or solid. Earth’s rotating molten iron core generates the magnetic field that shields life from harmful radiation, and helps prevent the atmosphere from being stripped away by high-energy particles in the solar wind. At some point in its history, Mars lost its magnetic field and much of its atmosphere, causing temperatures to drop and exposing the surface to intense radiation. InSight may help explain why, said Irshad.